As part of its July school holidays program the Sydney Opera House is presenting three shows – two of which I caught up with in the one day: Random Musical for ages 5+ and Horrible Histories: Awful Egyptians for ages 6+. It’s always so much more fun going to children’s theatre with a child, but with no littlie to take, a friend/colleague and I rocked our inner infant for the day. We started with Random Musical, which was utterly charming: a lo-fi delight that had us both laughing our way through the hour-long show. Once seated, the children are asked to write their name and a word beginning with the same letter on a piece of paper which is then collected by the performers. 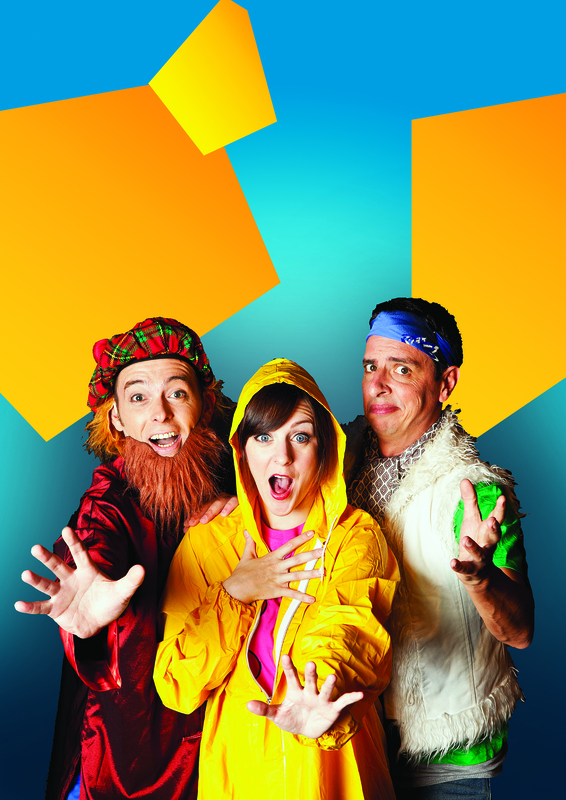 The cast of four “randomaniacs” – Scott Brennan, Rik Brown, Gillian Cosgriff and Rebecca De Unamuno, with John Thorn on piano – then create a musical on the spot inspired by some of those words. The first song That’s Pretty Random, which provides a framework in order to mention as many of the suggestions as possible (a lovely way to involve many of the children), was presumably written in advance. But from there on it’s all free-wheeling. Our musical was called The Zany Ostrich (thanks, Zach and Olivia), about a rare, pink-feathered bird who really wants to be a penguin. Meanwhile, an evil explorer – “the strangely named Georgia” – wants to capture the ostrich and turn her into a feather boa. The quick-witted cast did a superb job, not only conjuring plot and lyrics on the spot but singing spontaneously in various musical styles initiated by Thorn from English Musical Hall to rap. Brown, in particular, as the explorer, came up with some incredibly funny lyrics that included an exploding snake (which later became an integral part of the plot) and had them rhyming effortlessly into the bargain. He also fired off some brilliant one-liners. But all were excellent. Brennan did a lovely job as MC to get things going, De Unamuno was the sweetest penguin imaginable and Cosgriff made a great ostrich. The children embraced any opportunity for audience involvement. Getting them to supply a few more sound effects might be a good idea to keep the youngest really engaged. But props to all involved. A great little show. A scene from Horrible Histories. 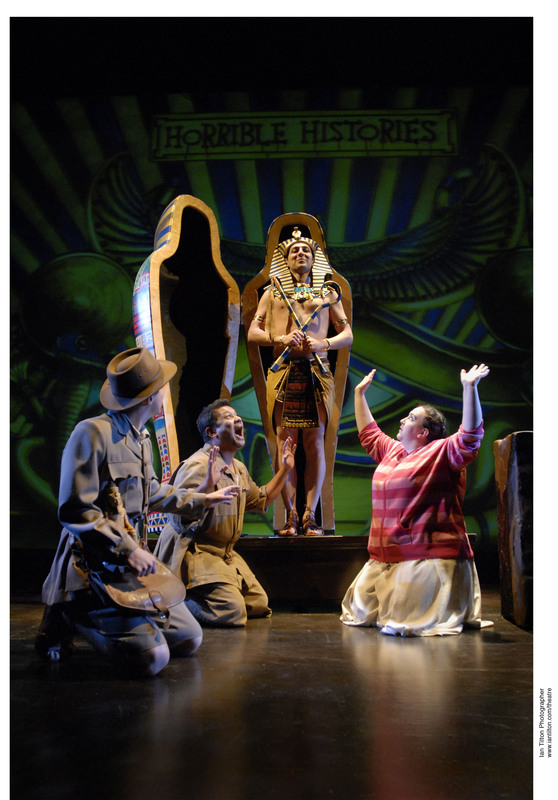 Horrible Histories: Awful Egyptians is a wildly different experience. It belongs to a phenomenon (which has passed me by as my children are too old) spear-headed by Terry Deary’s hugely popular books, which have spawned live shows and a BBC TV series. This production is performed by the British-based Birmingham Stage Company. To the uninitiated it’s a weird mix of historical fact, broad British humour in a pantomime vein, with slapstick, lots of terribly corny jokes, hammy acting and lashings of gore (think rubber intestines and other body parts being flung freely). But the buzzy audience couldn’t have been more excited. The plot involves an archaeologist and his dorky assistant who try to steal a statue of Ramesses II from a museum. Together with a schoolgirl on a guided tour, they conjure up the spirit of Ramesses himself who explains all about Egyptian history including the pyramids, mummies, Tutankhamun and the afterlife. Running two hours it feels far too long for the material, though the second act features some pretty speccy 3D effects. However, the audience seemed to be having an absolute ball. What’s more, demand is so great that the Sydney season quickly sold out so an extra show has been added on Saturday July 13. Random Musical runs until July 14. Horrible Histories also closes in Sydney on July 14 then plays at Melbourne’s Her Majesty’s Theatre, July 19 – 21. This entry was posted in Musical Theatre, Theatre and tagged Birmingham Stage Company, Gillian Cosgriff, Horrible Histories, John Thorn, Random Musical, Rebecca De Unamuno, Rik Brown, Scott Brennan, Sydney Opera House, Terry Deary by jolitson. Bookmark the permalink.